This seriousness of this problem led to an international campaign a few years ago called Beat the Microbead, which has seen California recently banning microbeads in cosmetic products. For years, research has shown that beauty products made with tiny microbeads, gritty cleansers that scrub off dead skin cells, have been damaging water supplies, marine life and the ecological balance of the planet. The seriousness of this problem has led to several countries taking a stance against microbeads - the United States and Canada have already begun the process of banning microbeads, and Australia has threatened a ban if companies do not voluntarily remove them from their products. The New Zealand government likewise announced in January of this year that cosmetic products containing microbeads will be banned in July 2018. These bans are all small but monumental steps in the right direction, and while there is more progress to be made, local brand Trilogy are proud to say they have never and will never use plastic microbeads in their products. They proudly strive to minimise their impact on the environment and be ethically and environmentally responsible with every choice they make, and have had an association with the international Beat the Microbead campaign since its inception 2013. So, it is with great joy that I can repot that Trilogy’s Gentle Facial Exfoliant features in Fauna & Flora International’s Good Scrub Guide, identifying products that use safe, natural alternatives. Trilogy’s products have always been and will continue to be free of plastic microbeads, and the formula is top notch too. Formulated with natural, biodegradable and non-abrasive jojoba wax spheres, Trilogy’s exfoliant gently polishes the complexion, refining its texture and improving clarity without irritation or compromising the skin’s natural barrier function. It is gentle enough (when used properly) for even a reactive skin like mine, and it nourishes too. 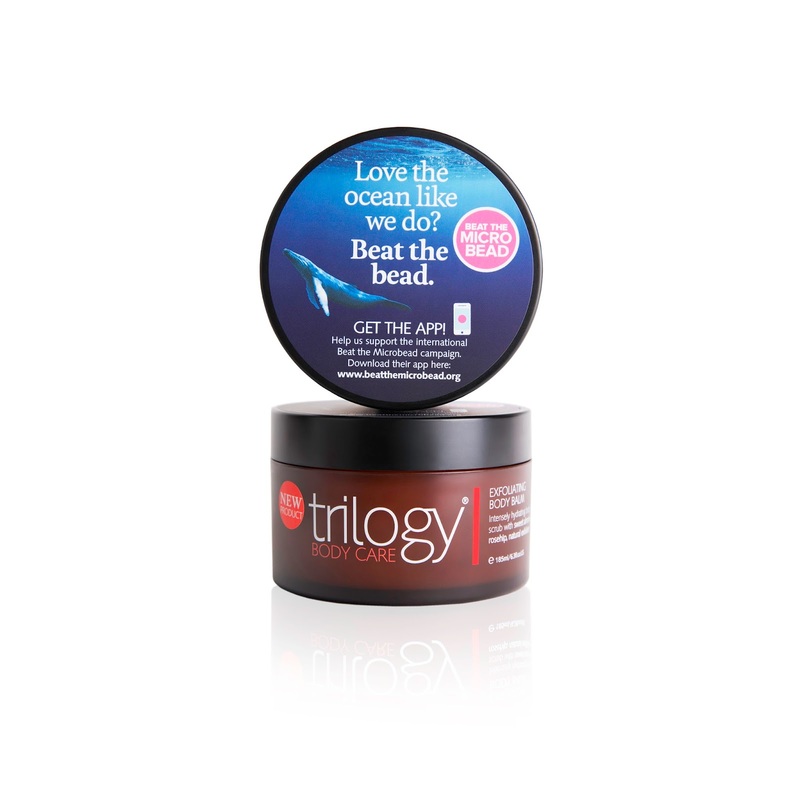 Also joyfully free of microbeads is Trilogy’s Exfoliating Body Balm, a NATRUE certified natural body polisher that leaves skin silky-smooth, hydrated and glowing. This buttery-textured balm is a luxe treat, and I for one have been a huge fan of it since its release. The natural exfoliant in Trilogy Exfoliating Body Balm is finely ground rosehip seed powder, another example of an innovative, biodegradable, ocean-safe alternative to plastic microbeads. The powder is ground from the solids which remain after the seed oil extraction process, making good use of a by-product and thereby reducing waste. Amazing. Oh and in further love and support for our oceans - for the month of June, Trilogy will contribute $2NZD for every product sold worldwide, to the NZ Whale & Dolphin Trust, committed to the conservation of NZ’s whales and Dolphins. Love that!